Irene Lindsay is the Assistant Head of a 2-form entry primary school in Raynes Park, London, which was refurbished by Haverstock Architects in 2012. She has been working in primary education as a teacher since she trained at Roehampton University in the early 2000s. Before that she worked in music education while bringing up her four children. Her first degree, from University College, London is in geography. Tell me about your first experiences of school. I went to eleven schools because my parents worked for Shell and we travelled all over the world. So my first schools were in Africa, but inside a Shell compound. I remember those schools being very white and gleaming with lots of windows and air conditioning. I don’t remember doing a lot of work and when I came back to England at seven and went to my first primary school here, I couldn’t hold a pencil (laughs). My first school in England had a front hall with a sweeping staircase and the smell of highly polished wood, which obviously I’d never come across in Africa; that really hit me. The most amazing thing about that school was that we had fields all around. I can only think that, with health and safety, you would never allow a child near them now. Nobody ever seemed to supervise us, probably they did, but I don’t remember being limited in what we did and we used to run to these fields with trees around them and make camps. It was absolute heaven. We played games about horses and brumbies and all the books we were reading. And I remember digging up pottery because there used to be an old cider factory there and I’ve still got a piece of it. They were very free days, very relaxed days. We used to parade to a local church, which was very modern, a bit like a flying saucer, and we’d parade through rose gardens. Nuns love roses. The whole school sat down at long refectory tables to eat lunch and we all had to eat the most horrendous food. We had to finish all of our lunch. The worst thing about it was new potatoes in tins, they were disgusting. To this day I feel ill remembering them. We used to hide them in our socks and then we’d go out to the playing fields and scoop them out. I don’t remember my parents reading to me but once I’d learned to read it occupied a lot of my time and I’d snuggle in a corner to read a book or by the fire or outside in the grass, enjoying getting away from my brothers. In Africa I remember sitting reading with Marcellina, a housemaid who loved the fact that I could read to her. Possibly she could read, but she certainly let me believe that I was reading to her. How do you create inspiring reading places in the school where you work? I have used themes. The best one was an Andersen shelter made out of chicken wire and papier mache. Teachers should have shares in IKEA and Tiger! Classrooms are so busy and lively, you need an area, some cubby holes and cosy places where children can be quiet in their own world, a comfortable place to escape to. In my current classroom the reading corner is just outside the classroom door. How do you manage supervision when children are outside the classroom and you are inside? Expectation! You explain why it is important that they are quiet and ask children why they like quiet when they read. They tell tales on each other anyway! Children read not just by sitting and looking at words, but enjoying pictures or brochures too. If they want to discuss what they’re reading and can do that quietly without disturbing other children then that’s all part of the experience. What about finding a space for a reading corner? I don’t think (the most important thing) is space, I think it’s time. I just think there isn’t enough time. You can enjoy reading in tiny spaces. It’s all about the intention really. If you had a lovely big open space it would be great. But basically you’re saying to children,‘This is your place to escape and I trust you to know why you need to behave there. What you look after will then be looked after by someone else for you too’. Last year there was a boy in my class who couldn’t still sit on a chair for three seconds in class but he would show real respect for his peers out in the reading corner. That reminds me of the most magical moment for me of last year. He was such an underachiever and I was so worried about him moving him on to secondary school, but he discovered Alex Rider books and I saw him read a whole book out there. Before Year 6 he’d never read a whole book. And it was a most extraordinary moment we both had together because once you’ve done that once then there’s no limit. And that’s because there was an area he could go to outside the classroom. Sometimes he’d go out there on his own – the classroom was too much for him – so he’d go out the reading area on his own. During the summer we go out to the park and read under the trees and some of the children can be quite far away and, OK, some of them want to pick daisies, but the hope is that they’ll soak in that joy of a summer’s day with a book. Your Year 6 classroom and one of the classrooms in Year 1 is too small to comfortably seat 30 children at tables. You have 24 children in your class but how does the Year 1 teacher cope with 30 pupils? We have a breakout area outside the classrooms. It used to be a long corridor that you would walk down to get from one end of the school to the other. I remember the first time I visited the school I was so impressed by the way that these children, who were rotated groups from Year 1, would take their books out there and often work without any support, the teacher just popping her head out occasionally. And that’s something that children can learn. You learn to hang your coat up, you learn to sit on the carpet, you learn to line up: you learn it! What’s also impressive is the respect shown by the children walking past. It was a small one-form entry school and every older child in the school had already experienced this way of working in Year 1. So as they walked past they were respectful. And as the school’s got bigger that feeling has continued. It can be harder to maintain with a bigger school but it still works. What about noise in the school, how do the acoustics work with the large corridor and balconies? It’s something we’ve had a big effort at this year as a school. It’s very difficult if some children are going to lunch and others are working and we certainly have a very open plan system so if you’re upstairs doing guided reading and downstairs they’re going to lunch then it can be quite noisy. But I think it tends to affect the adults more than the children. The children can block out noise more effectively but if you’re the adult trying to concentrate on a response then it can be quite distracting. We’ve had a big emphasis on moving around the school quietly. If you can talk to children about why it’s important and where they can make noise then it does work, but it’s not going to happen without a consistent approach. How do the breakout areas work? Sometimes people will take chairs out to the breakout areas but they’re not reserved for certain classes, so year 3s might be sitting outside Year 6 classrooms and if there’s a free table there you can go and sit at it. It tends to be mainly Teaching Assistants because obviously the teachers are with the rest of the class, but sometimes I try to change that a bit so it’s never completely predictable because if a class has a routine and know the expectations, the classroom can stay very quiet while you are outside with a group. Your school has been recently refurbished. As a teacher who is married to an architect do you have an insight into the process of consultation between architect and school staff during a rebuild? Communication is key. I’m not sure that teachers always know what they want, except for more cupboards or more space, so I think an architect needs to have a strong belief in their own ideas. Certainly that was true with our new building. Some teachers said that they didn’t like the concrete, but they respected the strong principles of the design. What was the central idea behind the redesign of the school? The architects were constrained by the closeness of neighbouring houses, but the main idea was to retain light and give the space to the children rather than to dictate the space itself. It’s not brutalist but it is rough and clean and light. What were the main problems with the finished school? The school couldn’t afford to buy blinds, so the smartboards are difficult to see and the electronic windows can open when you don’t want them to. We have moaned at the architects about things like that. But in general it was a very successful building within the constraints of the money etc. Do you think if teachers had an opportunity to learn more about the design process it would lead to a better designed school? I don’t think many teachers know about space. I think they know that they like teaching in groups or in rows. It would have to happen in training but you could arrange that.Teachers are very happy to try new things, we’re constantly being developed as a profession and I think we are all really reflective. We could change our classrooms every week, every day even. Certainly having an architect-husband helps me. He tells me about the most effective use of the classroom space. He will angle things and put things where I wouldn’t necessarily have done. I used to have my desk positioned so that I could see the smartboard but with my back to the children and he turned the desk around by 90 degrees. It’s such a simple idea and now everyone in the school does that. What about storage space? Should it be sacrificed to create more teaching space? I think they are both equally important. My biggest complaint is that I can’t store things efficiently so I can find them quickly. So I think there is a benefit to having storage space but it doesn’t need to be vast. 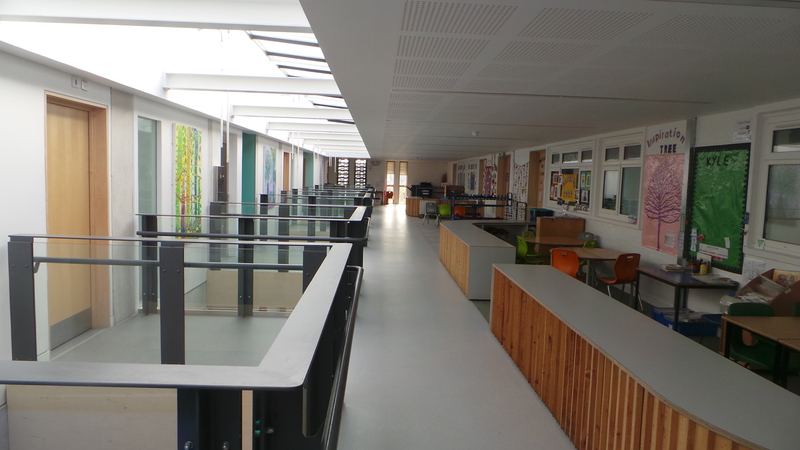 The new classrooms that we have in the school have high ceilings and narrow cupboards, which are so valuable because you can get up a ladder and store Christmas things and exam papers at the top. The biggest problem is with communal storage space. When I first joined the school each class had its own set of 3D shapes and rulers but they kept getting lost or broken so now everyone has ended up buying their own set. We also put on a production every year but there’s nowhere to store the costumes and props and so every year we have to start again from scratch. What a waste of money! Our architects designed an all-weather sports pitch and they put storage cupboards for all the PE stuff underneath. They’re quite deep and you had to lie on the ground and crawl through them to reach a football, so they haven’t worked. Now the PE stuff has gone into an empty garden shed and we’ve tried to find things that could go into the new storage place that won’t be damaged by damp. An original idea, very clever but not practical! If you could change just one thing across all schools overnight, what would it be? I’d have a librarian in every school. Having worked in the private sector and seen what someone can do who is employed to do that job, I realise it’s a powerful thing. It’s all very well to have library space but you need to have someone to manage it, to encourage the children to want to use it. Having seen school librarians in action – they get authors in, they get book company freebies – it’s so beneficial. We used to have a library in this school that was out in the corridor and then it became electronic and all the children had codes, which they all lost and then nobody used the library. So by the time they got up to Key Stage 2, the teacher didn’t have the time to take them and the children didn’t have the codes to get the books out. But you now have a London bus that you are going to use as a library. The idea is to create a place that teachers want to take their class to every week. The bus was donated by a parent, but it needs planning permission; the engine needs to be removed, there’s heating, lighting, and maybe six months of talking to planners. They’ve taken out the engine but it can’t be permanent (for planning reasons). The next step is to get the local community involved. There’s so much scope, if people in the community knew what we were trying to do with it, why wouldn’t they come and give up their time to help us? Previous Problem-solving and school design: an interview with Tim Byrne.